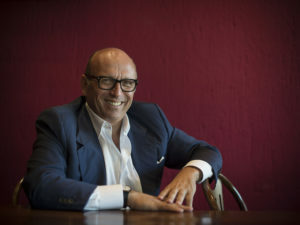 Maurizio Zanella was born in 1956 in Bolzano. He studied agriculture and his introduction to the world of wine came in the Sixties, when his mother acquired a small hillside property called “Ca’ del Bosc”. Maurizio Zanella is an extensively travelled wine cosmopolitan who has put into practice in his native Franciacorta what he learned in France, particularly Burgundy and Bordeaux. In 1968, he created Ca’ del Bosco, today the leading producer of fine-bubbled Franciacortas. Ca’ del Bosco’s pre-eminence has been driven by Zanella’s passionate enthusiasm. In the early Seventies, he embraced his artistic creativity and became one of the leading figures in Italy’s wine renaissance by transforming what was a house in the chestnut woods into one of the country’s most modern wineries. At Ca’ del Bosco there is a single principle behind and defining all its production, from grape selection to bottling: quality, or better, only the highest level of quality, excellence. Its wines must meet the prerequisites that make fortotal drinking pleasure: absolutebalance and perfect harmony. Ca’ del Bosco enology assists the natural expression of grape quality and typicality, which depends on their varieties and how the vines are grown. Winery philosophy is based on using technology to get full expression of the grapes and thus make the finest wines possible. Every batch of grapes harvested has a unique personality to be revealed and directed towards its highest expression.